Note: Happy New Year! I thought this was the perfect post to start off 2013! It’s bright and cheerful and made by my mama and brother! I’m going to spill the beans about 1 and 2. 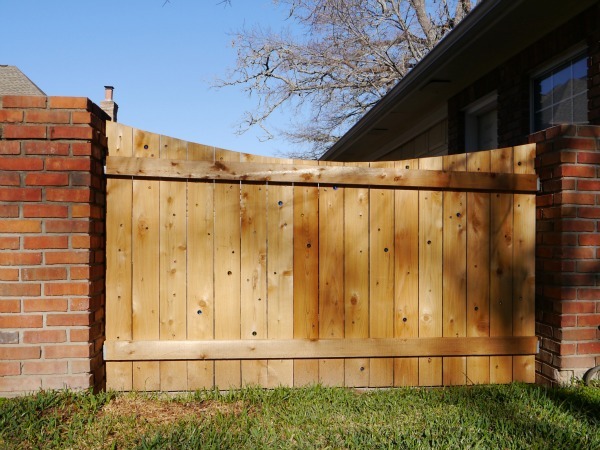 If you want details about making a removable fence panel, you can email me and I’ll ask Zach and my mom. How to make a concave swoop: Zach’s secret to making a perfect concave fence swoop is 1″ PVC sprinkler pipe (or any flexible, long material). Just lay it over the top of the fence, and adjust the swoop to your liking. Note: This is a 2 person job! When you’ve decided on the perfect swoop, trace the pipe line, and then use a sawzaw to cut along the line. Bam. Zach is a pretty handy with a Sawzall (here’s a link to the one he has )… If this is your 1st rodeo, I suggest doing a few practice cuts. 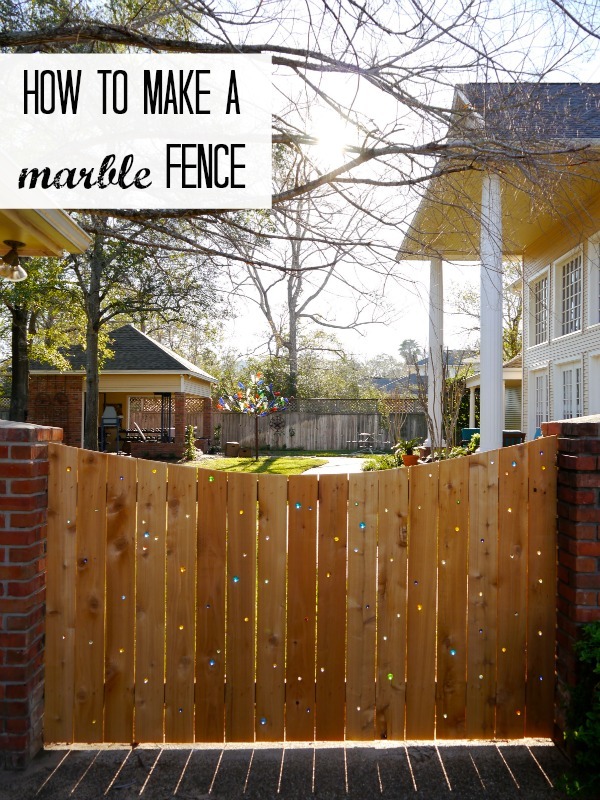 How to add marbles to your fence: My mom bought marbles online. Just make sure your marbles will let light shine through. You also need a rubber mallet and a drill. Use a practice board to find the perfect size drill bit for your marbles. My mom used different sized marbles, and had to have different sized drill bits. It’s pretty simple, just drill a hole in your fence, and use the rubber mallet to pound in the marble. You want the marble to be snug as a bug. Here is one more front view. See the bottle tree peeking over the brick pillar? 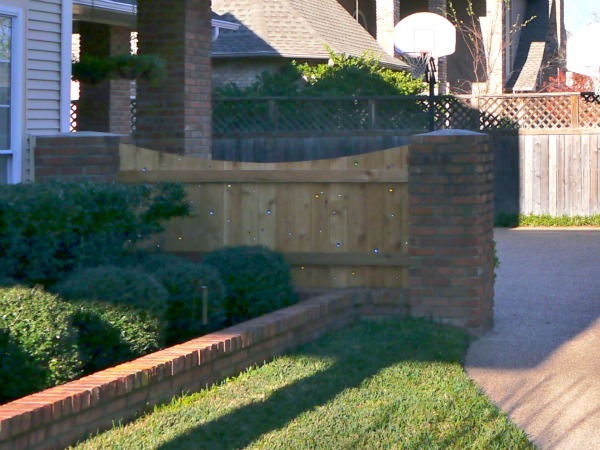 what if someone steals or breaks your fence??????????????????????? Steal your fence? I don’t get it? If someone steals your fence, they clearly need it more than I do! Then I guess she has lost all her marbles…. Love this! It’s so fun and playful!! Playful has a few meanings. Ally, all caps? Really? The use of playful makes you emotional? We could all use something whimsical to lift our spirits. I TOTALLY AGREE!! This is fun and playful! Some have said it looks magical – love that! Playful: intended for one’s own or others’ amusement rather than seriously. Looks amazing! I had no idea it would turn out so cool! Thanks for showing the pictures! Love the Marble Fence! The way the angles change the sparkle of the marbles is really neat! I think that marble fence was one of the first things I ever pinned on Pinterest! Still haven’t done it, but yours looks fabulous!! Danni! Me too! I always thought it was such a neat idea. That turned out so cool! Love what it looks like as the light hits the marbles!! What a marvelous idea! I love the color and light! Thanks for sharing! The color and light is super fun 🙂 It’s different all day long! SO awesome! I love this! Thanks, Lorie 🙂 My mama loves it too! hello, it’s a great idea that i’m trying ton do myself. i have one little question, as the wood works how those the marble keep in their holes ? For a marble of 16 mm you use a drill of 16 or 15 ? I would suggest using the 15mm! Then use the rubber mallet to mak the marbles as tight as possible in the fence! This is great and I love how it looks with the sun shining through! Hey Jamie! Just wanted to let you know that my neighbors and their kiddos did this over the weekend after seeing your post! It looks really cool, and the kids loved being able to help! They sent me a picture! I love when people actually do the projects that I post, so thought you might like to know! Keep being awesome! 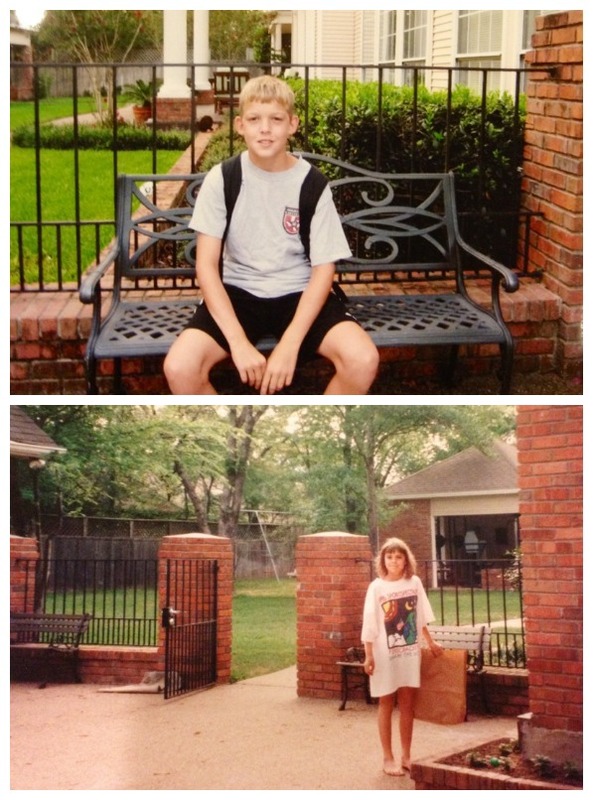 Thanks for joining us last week on Saturday Show & Tell; I’m featuring your Marble Fence this week! Do it! Do it! And thanks for featuring it! Excellent instructable for both the marbles and the swoop! I am curious about what happens when the wood ages and shrinks. Do you think the marbles are stuck in firmly enough to avoid them falling out? Thanks! Thanks for the tips! I’ve had this pinned for awhile but there was no tutorial. BTW, it’s called a Sawzall not a Sawzaw (actually the brand name of a reciprocal saw—sort of like Kleenex). Just in case folks try to google Sawzaw. I hope you don’t mind the correction. 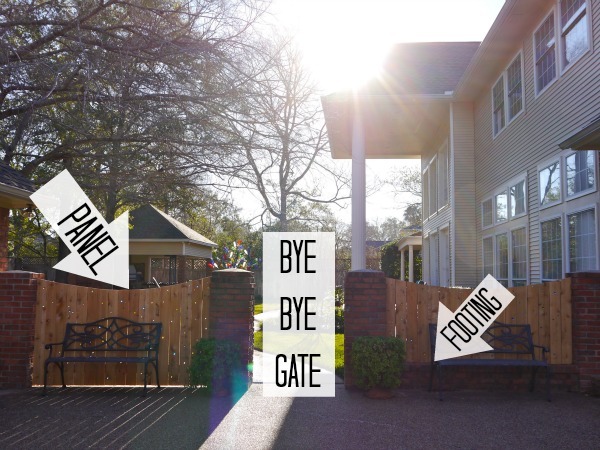 I’d love to know how yall did the removable fence. We’re about to tackle that project ourselves so I’d like to know how yall did it. Thanks! I grew up with your mom, and this is a perfect description! Love, love, love, the fence !! Fun! My mama said you are crafty too!! I took you idea and pused it up a level by doing this on both sides of a post fence that I used 2×6 between the front and back sides. On the top 2×6, I drilled some holes large enough to set a mason jar down into. Using the Mason Jar ring, I replaced the lid with the top part of some 2.00 solar lights. At night, the light is dim that escapes between the boards, but brighter where the marbles are. I’ve got some jealousy neighbors and it looks great!! 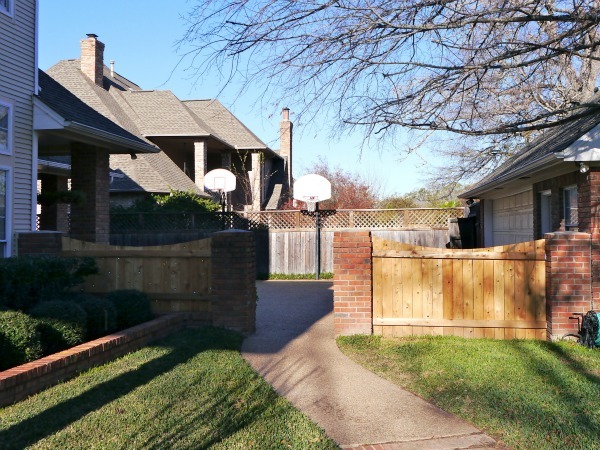 I would love to see your fence! I’ve been wanting to do this for some time and this weekend is the one! We are putting ours around two sides of our eye sore of an air conditioning unit. We are going to stain the wood a little bit darker to blend better with the house! Looks beautiful….love it and the tree! Thank you for sharing. It is beautiful. Your mom is a doer, just like me. The satisfaction is amazing. Enhancing the beauty that already exist in nature. This is so beautiful – i too have the ‘marble in the fence’ image pinned on pinterest (its been there for months) i would love to try this! This is super cool! I like the added sparkle! Thanks for sharing on Found & Foraged. I saw this on pinterest and re-posted as well. 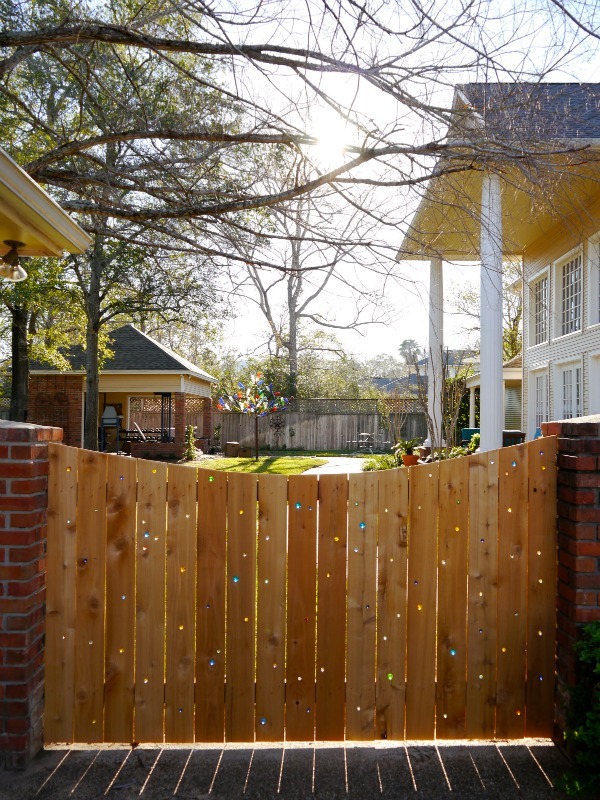 I LOVE this idea and just replaced a fence so now I can do this. 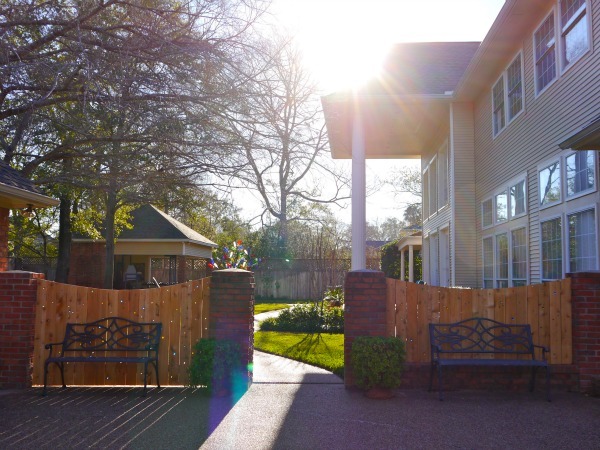 Is this your personal fence or just something you saw ? I am curious where you got the “right” marbles for the look that is shown here – with the sun shining and the colors transparent ? I want to do this …. 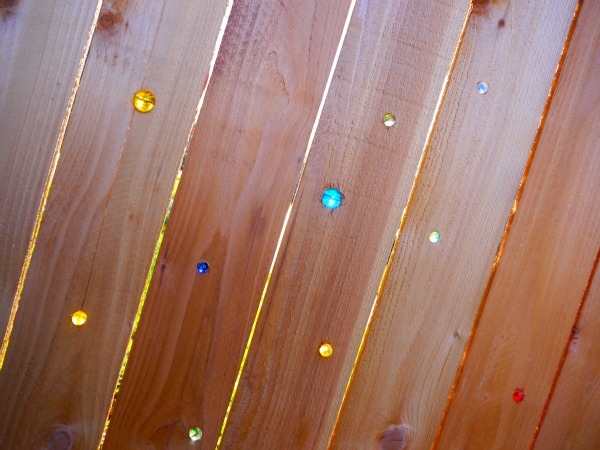 if you did it, can you please advise and suggest how many marbles per fence panel ? Thank you !!! Such a fun and creative idea! I’ve never seen this done before. Thanks for sharing it! It’s been a few years since you posted about this fence so how did it hold-up to the weather? Did the marbles fall out or did the holes split the wood? Hi Laura! The fence is holding up great! I will take pictures of it next time at my mom’s and do a little update! The marbles to occasionally pop out when the weather changes, but they are very easy to stick back in the holes! The marbles would likely be in the way, but you could pop them all out for a paint job and stick them back in! WHERE did you get clear, colored marbles in different sizes?? I’ve been looking online for days to no avail! Try a Dollar Store or a craft store for marbles or beads. / kind of marbles you used? ?